BOSTON--(BUSINESS WIRE)--XL Hybrids, Inc., the trusted industry leader in connected fleet electrification solutions for commercial and municipal fleets, is displaying three fleet-ready, electrified pickup truck solutions at NTEA’s Work Truck Show, March 6-9, 2018 in Indianapolis. XL is unveiling the industry’s first-ever XLH™ hybrid-electric F-250 pickup in its booth (#3075), while also displaying an XLP™ plug-in hybrid-electric F-150. Both trucks in XL’s booth will be displayed on vehicle lifts so attendees can step under the trucks and see how easily XL systems integrate with the Ford trucks. Now fleets can enjoy an up to 25 percent increase in miles per gallon – and accompanying reductions in CO2 emissions – on trucks used for rugged towing, hauling capacity, and utility applications. The company begins production on the XLH™ hybrid electric system for model year 2018 Ford Super Duty® F-250 pickups in March. This will be the first time that Ford F-250 trucks can be ordered by fleet customers with hybrid-electric technology. At the NTEA Work Truck Show, XL is also announcing compatibility with more F-150 models, including SuperCrews. XL now offers fleets XLP PHEV upfits, which provide a 50 percent improvement in miles driven per gallon, on Regular Cab, SuperCab and SuperCrew configurations for the F-150. Installation of XLH hybrid and XLP plug-in systems are completed in just hours on pickup trucks as a Ford ship-thru upfit. Fleets will maintain the complete original equipment manufacturer’s (OEM) warranty and receive a three-year, 75,000-mile warranty from XL on the hybrid powertrain. XLH and XLP will also include the XL Link™ cloud-based big data analytics system, which collects millions of operational data points, measuring MPG performance, reporting carbon dioxide emissions reductions and other key performance indicators. 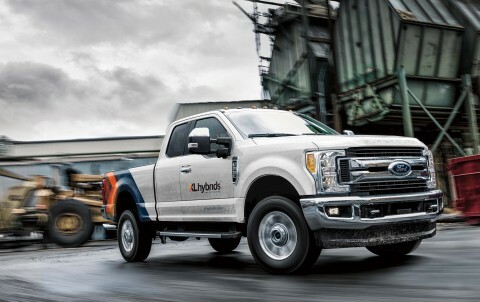 Ford Motor Company will be showcasing a third XL truck in its booth (#3239) at the NTEA Work Truck Show, this one an XLP plug-in hybrid-electric F-150. Last year, XL became the first-ever company to be recognized as an Electrification Qualified Vehicle Modifier (eQVM) in the new Ford certification program. The company also recently announced its latest executive order from the California Air Resources Board (CARB) which has approved XL-outfitted PHEV Ford F-150 pickup trucks for sale in the Golden State, an industry first. Clay Siegert will also moderate a panel at the NTEA Work Truck Show featuring representatives from Verizon’s and Sempra Utilities’ fleet teams to discuss “Identifying Fleet-Ready Technologies to Avoid Risk when Deploying Electrified Vehicles” at 9:30 a.m. on Thursday, March 8, 2018. The company will exhibit and hold a press conference during the show at 9:30 a.m. at booth #3075 on Thursday, March 8th. For more information on XL’s technology and availability, visit www.xlhybrids.com or email info@xlhybrids.com. XL Hybrids is the leader in connected fleet electrification solutions for commercial and municipal fleets, relied on by customers such as The Coca-Cola Company, Yale University and the City of Boston. With the revolutionarily simple XLH™ Hybrid Electric Drive System and the XLP™ Plug-In Hybrid Electric Drive System, Class 2 to 6 commercial fleet customers can increase their fleets’ fuel economy by around 25 percent and reduce carbon dioxide emissions, decreasing operating costs and meeting sustainability goals with zero impact on fleet operations or service. XL works with Ford, General Motors, Isuzu and other major OEMs on the proven path to scaling thousands of commercial trucks, vans and shuttles. Founded by MIT alumni and funded by Constellation Technology Ventures, IKEA Group and private investors, XL is based in Boston. For more information, visit www.xlhybrids.com. XL Hybrids, Inc. is unveiling the industry’s first-ever XLH™ hybrid-electric F-250 pickup in its NTEA Work Truck Show booth #3075 for fleets.